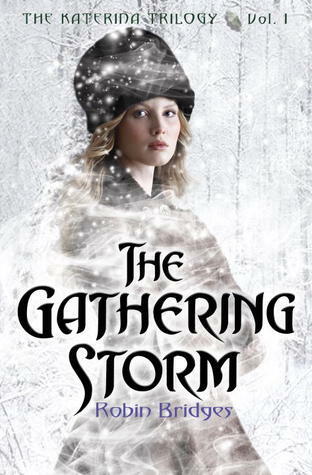 I have not read many books like The Gathering Storm before--a hybrid between historical fiction and paranormal fantasy--but after completing this, I want more! Robin Bridges brings a meticulous eye to period details, like clothing, food, architecture, social norms, which only enriches the reading experience. I could easily picture each scene from the hallways of The Smolny Institute for Young Noble Maidens to ice skating parties with royal members to dancing at seasonal balls. The grandeur of the ballrooms and those beautiful gowns, the sparkling jewels encrusted in tiaras--it's marvelous. To add in paranormal elements during the time of Imperial Russia fascinated me and makes this unique novel stand out in the genre. Don't ask me to say the names of the characters out loud or spell them--I would fail and there is quite a large cast of characters (which didn't bother me at all). The Gathering Storm sets the foundation for a world mired in the past in which one strong minded girl wants to rise above the restrictions placed upon her gender to study medicine and become a doctor, despite her 'dark gift' to bring back the dead. As her powers are discovered by members of the Dark and Light Courts of Russian society, Katerina fights to keep her power a secret. There are blood drinkers who want her for their own gain in the power hungry fight for dominance over the other races of faeries, wolves, zombies and more, and others who view her as an abomination. All Katerina wants is to be good and help others but the more she inquires about both her necromancy skills and the otherworldly groups intent on destroying the tsar, the more she becomes a target. This story has so much going for it--involved story lines and subplots, a wide array of characters and classes, paranormal creatures ranging from different vampire factions to an army of undead soldiers to seances and ancient talismans, all amidst the impending advent of change--in medicine and of the times. Katerina drew me into her world with her independent way of thinking, her modern sensibilities and intriguing gifts. When the son of a powerful vampire family, Danilo Montenegro, sets out to claim her as his own before his ascension ceremony, an elderly Princess warns Katerina her life is in danger, but who can the sixteen year old student trust when she is thrust into a world she never knew existed, with powers she's clueless about? I did wish Katerina would crack open that necromancy book she was given sooner but there was a lot going on in her world. She did have her moments of being the damsel in distress and I was glad to see her think she didn't like being the victim. It was easy to root for her and fun to watch her scenes with George Alexandrovich (the tsar's middle son--loved his mind reading ability) from their first dance in the beginning, to her bandaging him, to the carriage ride at the end. Secrets have been spilled, identities revealed, old fashioned sensibilities swayed, declarations of love and promises made, The Gathering Storm reads like an absorbing night time drama told from a teen's perspective. Wouldn't it be cool to see this book series serialized on PBS? All I know is I can't wait to dive into book two, The Unfailing Light. Cover comment: It's a cool cover image but after reading I think something more could have been done with the cover. Still, the picture depicts the time period and the model looks like what I envisioned Katerina to look like. Book source: I received the hardcover from the publisher in return for my honest review during a book tour for the author's second book in the series. I read this in the beginning of the year but unfortunately most of it didn't stick with me. I do remember wanting Katerina to do more and maybe be a bit smarter as I thought she was kind of slow to pick up on some things.